My project list has had RepRap 3D Printer on it for a long time… way too long. There are a few reasons for this. One reason is that I just don’t get large chunks of time to work on it. Working two jobs, having a family, and doing “other things” keep me pretty busy. Another reason is that I get involved in other projects. Most of the other projects are short-term, quick ones. Like the Arc-O-Matic, or another Drawbot, or some weird art, or small things that take maybe a day or two (or three) but not months. But one of the other things that may have slowed me down in this project is… fear. With so many of my projects, they tend to be within my comfort zone, or just slightly outside of my comfort zone, but not way outside of my comfort zone. The RepRap has been (at times) outside of my comfort zone. I tend to like visual instructions. You know who excels at great visual instructions? Adafruit does, as does Evil Mad Scientist Labs. That’s why I love getting kits from them, and supporting them their work. 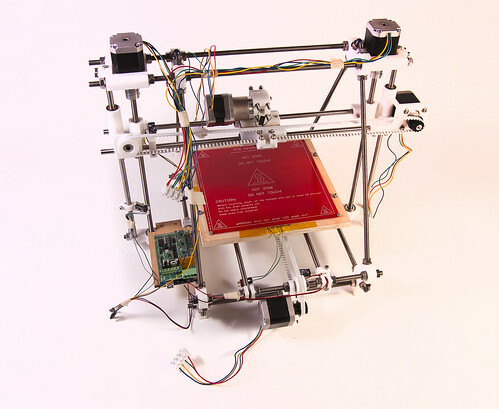 So this fear I mentioned… at some point I think I got too wrapped up in making sure I did everything right, but here’s the thing about a RepRap, even if it is a kit, you won’t do everything right. Nope, try as you might, you’re going to screw something up. Even if you’ve built other kits, and follow all the instructions, and use the mailing list, and blog posts, and IRC, and Google+… unless you’ve done it before, you will screw something up. (Hell, you might even screw things up if you’ve done it before.) But here’s the thing to remember: part of building a RepRap is learning, and that includes learning from mistakes. Building it up from a box full of parts does one thing, it ensures you can (probably) tear the whole damn thing apart and fix it. With all these new 3D Printers coming on the market that are fully assembled, that may not be the case. That’s one of the big questions I have. Let’s say you buy a 3D-A-Ma-Jig (yeah, I made that up) from 3D-A-Ma-Jig Incorporated, and it breaks… what do you do? What about repairs? What about warranties? Do you ship it back? Take it in… somewhere? This is part of the reason I went the RepRap route, so I would know every part of the machine. So this past weekend I got a lot done. I probably put in close to 10 hours, and I learned a lot in that 10 hours. Sure, I read blog posts, Google+ comments, and lots of poorly explained “instructions” with no images, but hey, if things blow up, I can replace them. I’m saying goodbye to fear and forging on. I may earn my Magic Blue Smoke Badge, but dammit, that’s a badge of honor, not just among RepRap builders, but hackers and makers everywhere! So what I’m really saying is, the RepRap is really close to being done. Posted on Monday, May 7th, 2012 at 6:00 am. Subscribe to the comments feed. Both comments and pings are currently closed. Post on your own blog. You can do it! It’s amazing how much goes into building one…and even then, the calibration I’ve found to be the most time consuming….fortunately I’ve had some knowledgeable friends around me that have allowed me to skip making a few mistakes but I certainly have made a few on my own….and every RepRap build is different so it can be ‘fun’ to troubleshoot. Good luck! Let me know if I can help if you get stuck. Thanks John! Yes, I’m aware that building is half the battle, and the second half is calibration and actually printing.